It launched the mini-3D boom in the early 1980s, but it was also the last gasp of the Spaghetti Western. It seems like the least likely of hits in retrospect, but its timing was perfect. Apparently, the world was ready for another round of 3D gimmickry and a band of American expats and Italian filmmakers were just the folks to deliver it. Prepare for a barrage of sundry items falling towards the camera in Ferdinando Baldi’s Comin’ at Ya! (trailer here), which is now available on DVD and 3D BluRay from MVD. Without Comin’ at Ya! there would probably be no Spacehunter: Adventures in the Forbidden Zone or Treasure of the Four Crowns (also from Team At Ya! ), so let’s thank our lucky stars this film exists. Kind of known for the “Stranger” films, Tony Anthony knew his way around a Spaghetti western, so he had street cred with the core fan base, despite looking a bit soft around the edges for a stone-cold killer like H.H. Hart. Presumably, Hart is a former desperado of some sort, but he had resolved to settle down with Abeline, his newlywed wife as of just after the opening credits (and what credits they are, featuring no end of falling dry goods. Unfortunately, the Pike and Polk Thompson, a pair of Mexican white slaver brothers crash the ceremony to abduct the bride and leave the groom for dead—but not nearly dead enough. With the help of a drunken old Scottish former seminarian (they are always handy in a tight spot), Hart will ride south to rescue Abeline and serve up some payback. It quickly becomes personal for the Thompson Brothers too, especially Pike, the mastermind. As a result, all sorts of lethal weapons will be hurled at the screen. Anthony is no Clint Eastwood or Franco Nero, but he has a pretty good badass strut. Victoria Abril (now most famous for her work in Pedro Almodóvar’s Kika and Tie Me Up! Tie Me Down!) is more than sufficient as the woefully helpless Abeline (watching her and the captive women shriek at a laughably fake bat attack is pretty cringey). However, Gene Quintano, who was later celebrated as the genius responsible for writing Police Academy 3 and 4, is quite decently dastardly as Pike Thompson. Baldi throws everything at the lens except the kitchen sink, but frankly that blatant ridiculousness is the whole reason to watch it. On the other hand, the level of violence directed towards women is a bit eyebrow-raising. Well beyond lax Spaghetti Western standards, it approaches Giallo levels. In fact, the entire film is wildly politically incorrect, allowing Hart full license to kill Mexican and Native American white slavers without a twinge of guilt. It is impossible to imagine to imagine Hollywood distributing At Ya! today, so it is nice to have its shamelessness preserved for posterity. 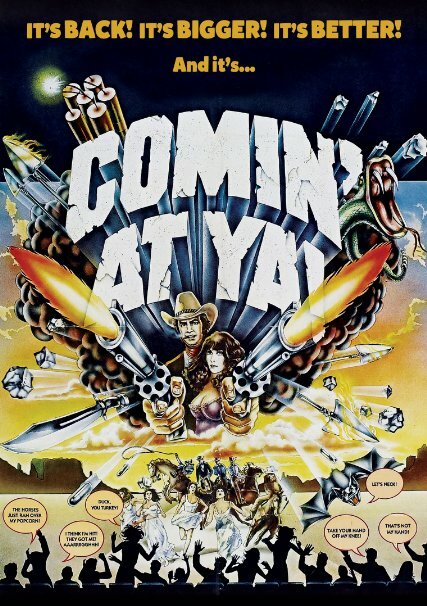 Recommended for fans of Spaghetti Westerns and 1980s nostalgia, Comin’ at Ya! is now available on 3D BluRay and regular DVD from MVD.